At one point, the girl can be heard screaming as two men drag her further inside the jungle in Jhansi and try to her gag her. The 6-minute video appears to have been shot by a young boy on a mobile phone. 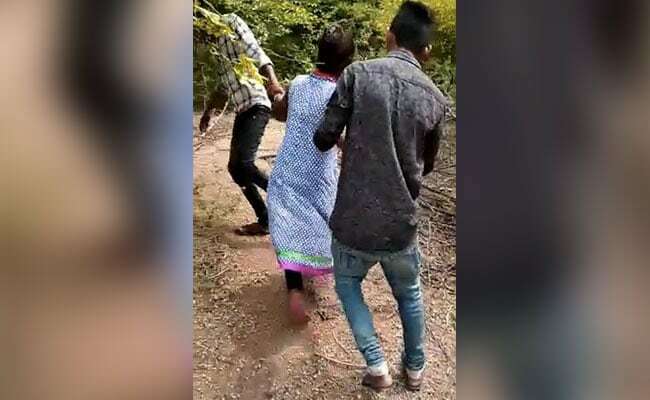 A video that has been circulating online since last evening shows a group of young men harassing and attempting to molest a 16-year-old girl in Uttar Pradesh's Jhansi. One of the men seen in the video has been arrested and two others are absconding. Preliminary enquiries have revealed that the incident is from July 12. Police said the girl was offered a lift by a boy, a friend of hers, when she was going to give food to her mother who was working in a field. The boy and the girl were passing through a forested area when a group of young men - including minors - stopped the girl and tried to molest her. The six-minute video appears to have been shot by a young boy on a mobile phone. At one point, the girl can be heard screaming as two men drag her further inside the jungle and try to gag her. The teenager, holding a steel container, a spoon and a water bottle, tells one of the men, "Leave my hand." The video also shows the girl sitting on the ground, surrounded by five men who are intimidating her and asking her what she was doing in the jungle. Two men can be heard telling the girl, "Just the two of us." The girl can be heard pleading with the men to not do anything to her. She tells them that she knows only the boy who offered her the lift. "There were six boys. Some were assaulting my friend, the others were trying to drag me away. I have seen one of the boys earlier. I think they would have eventually sexually assaulted me. But I was screaming, so perhaps that stopped them. One of the boys said there will be a panchayat," the 16-year-old said, narrating her ordeal. The girl and the men belong to the same village in a block about 40 kilometres from Jhansi town. It is not clear what happened after this. The girl's statement will be recorded today and she will be sent for a medical examination. "There are three people who are named. Two others have not been identified. The main accused has been arrested. The girl is a minor," said Kuldeep Narayan, a senior police officer in Jhansi. "The footage shows other boys apart from those named in the FIR. We will act against them too. The Senior Superintendent of Police in Jhansi is personally overseeing the investigation," said Subhash Baghel, the most senior police officer in Jhansi.